The Model A Ford is one of the most famous cars in the world. Many people do not instantly recognise it, until you point out that nearly every gangster movie you see, is quite literally full of them. Those old enough to remember "The Waltons" on television, would have seen John Boy driving around in his Model A Ford coupe, together with the family Model A Ford pickup truck. The Untouchables, staring Kevin Costner and Sean Connery, also relies heavily on the Model A. In later years, the movie "Road to Perdition" with Tom Hanks and Paul Newman, has a fantastic scene, where they drive into Chicago and a deluge of Model A Fords come towards you. My favourite scene is in the middle of the night, at a roadside diner. The local police officer has a black sedan, but parked outside the diner, is a 1929 Model A Ford pickup, exactly the same as my own. If you have not seen these movies, check them out. Henry Ford must be the most well known name in Automobile history and together with his famous model T has brought the name Ford to the forefront. The roaring 20s was the heyday for the Model T, but Henry Fords dominance was slipping as time went on and sales dropped from 57% of the market share in 1923, to just 34% in 1926, the lowest since 1918. 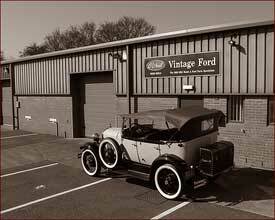 On May 25th 1927 after many rumours, Ford announced that it would build a new automobile. The official announcement of the new models completion was made by Henrys son Edsel on August 10th 1927 and there the model A was born. At the launch of the model A on 2nd December 1927, the car was met with spectacular excitement the world over. It has been said that 10% of the American population saw the car during the first two days. The new Ford was hailed as a huge success by the general public and although Henry Ford estimated the development cost at about $100,000,000 the car was priced almost the same as its model T predecessor and was decidedly less than Fords immediate competitors. Because the changeover to the new model was running slow not every dealer was able to show the new car on launch day but within a couple of weeks, new orders for the model A reached over 400,000.